Where is the next Clinique Bonus Time in April 2019? 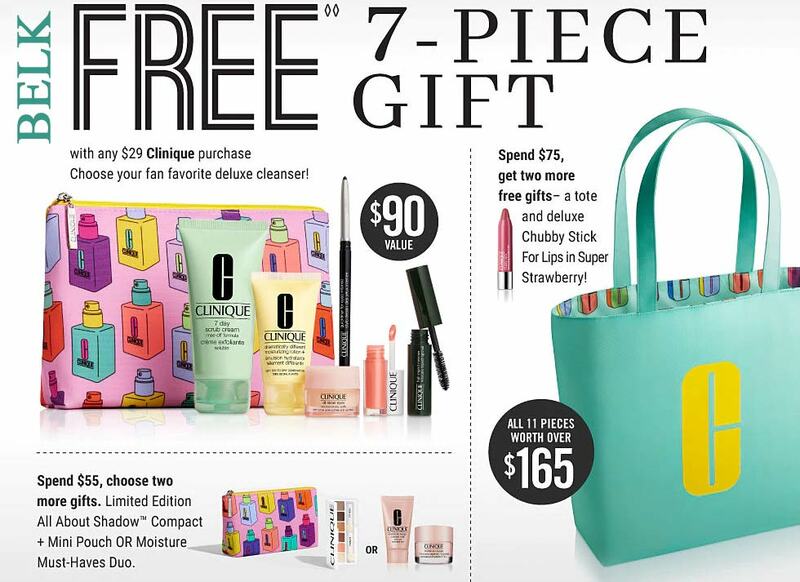 Starting from April 12, 2019 there are new gift with purchase offers direct from Clinique.com website and Clinique.ca website. Online only, receive this 7-piece gift with any $29 purchase. Available for the United States and Canada. Promotions end on April 23, 2019 or while supplies last. 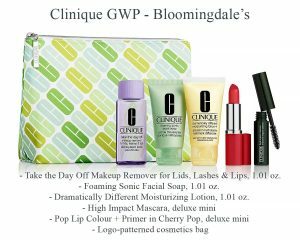 Starting from April 17, 2019 – while supplies last there is a new Clinique GWP – a cosmetics bag and 5 deluxe samples – yours free when you spend $40 or more on Clinique. Online only on Nordstrom.com website. Optionally, you can spend more ($55) and receive also minis of Pretty Easy Liquid Eyelining Pen in Black and High Impact Mascara in Black. 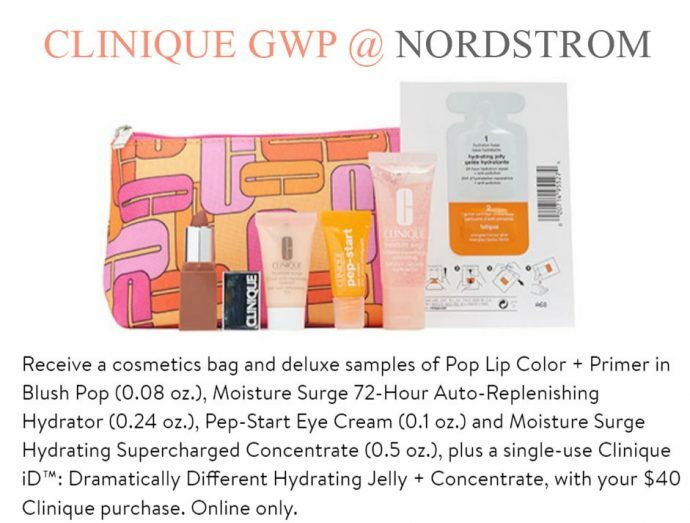 Plus, there are more free gifts with beauty purchases at Nordstrom. No promo code needed. Free shipping. 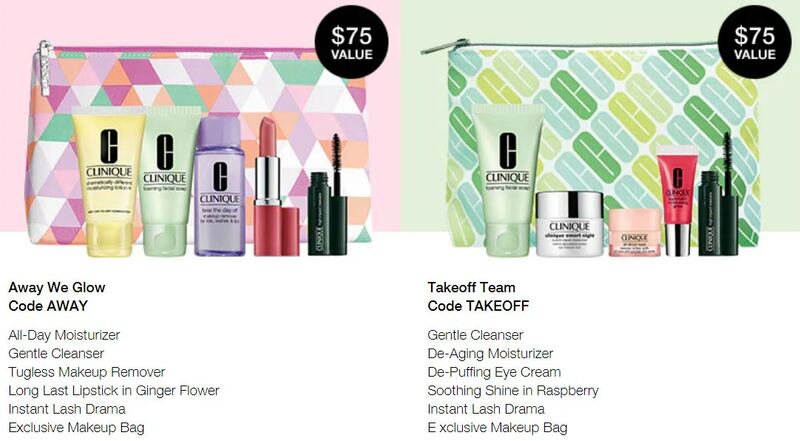 Bonus: Enter promo code CLINIQ6SF with any $50+ Clinique purchase to add a free duo. You can enter up to 5 promo codes at Saks – you can combine these offers together and also with special offers listed on Saks under the beauty section. Enter also promo code FREESHIP for free shipping. There is a new Clinique bonus at Von Maur. Instore and online. Gift: seven piece Clinique gift-set. Von Maur offers free shipping & free gift wrap with any order. No promo code required. 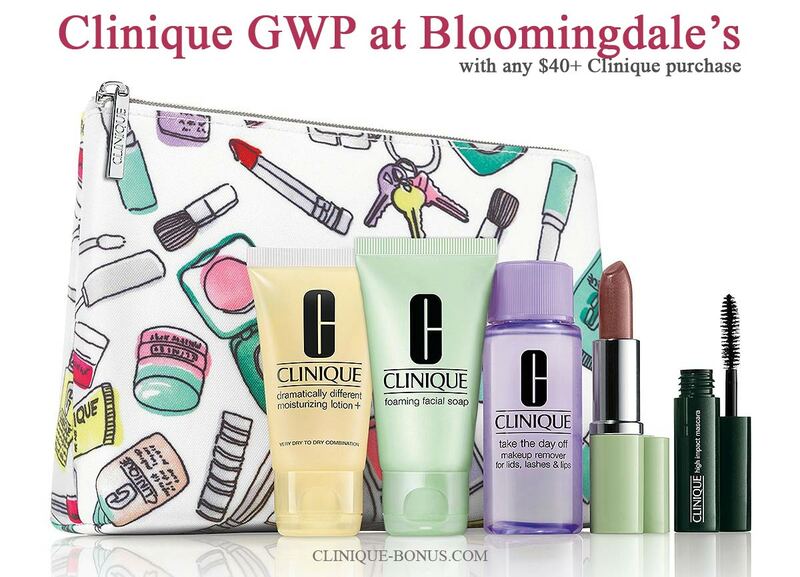 Receive your 6-pc Clinique gift free with any $40 purchase at Bloomingdale’s. Online form April 5, in stores from April 8, 2019. Offer may vary in store, while supplies last. Spend $75 or more on Clinique and also get a 1.01 oz. 7-Day Scrub for free. The gift will be added automatically at checkout, if not, it is out of stock. 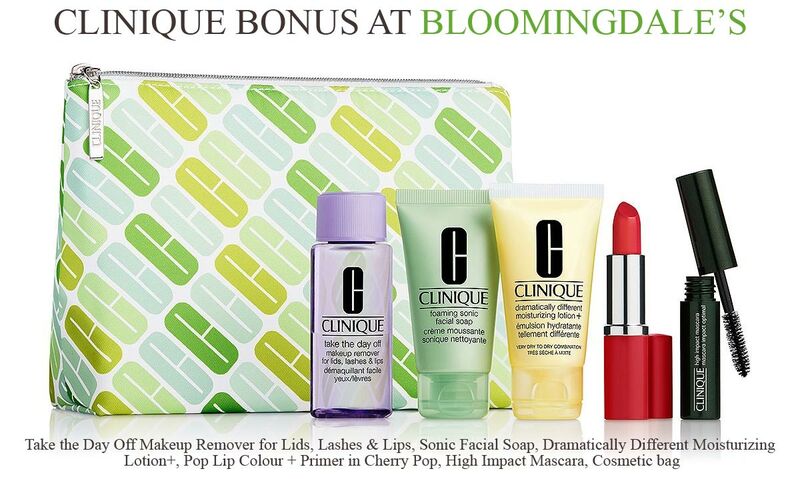 Celebrate Spring with this Clinique Bonus at Macy’s. Online and in stores from March 27, 2019, while supplies last. With any $29 or more Clinique purchase receive a cosmetics bag, 5 Clinique cult Classes and choose your Dramatically Different Moisturizer (full size). A $93 value. Your gifts will be added automatically at checkout. If not, they are out of stock. 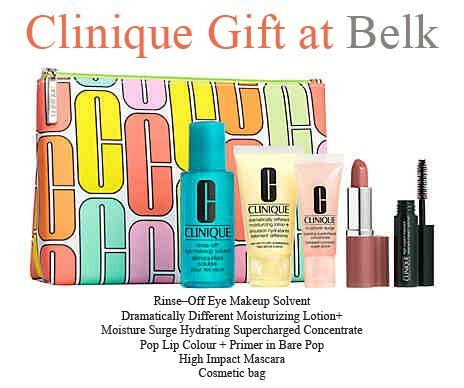 Shop Clinique during Belk Days and receive this 6-pc Clinique Gift when you spend $29 or more. Spend $75 on beauty or fragrance and also receive a free 9-Piece Gift. 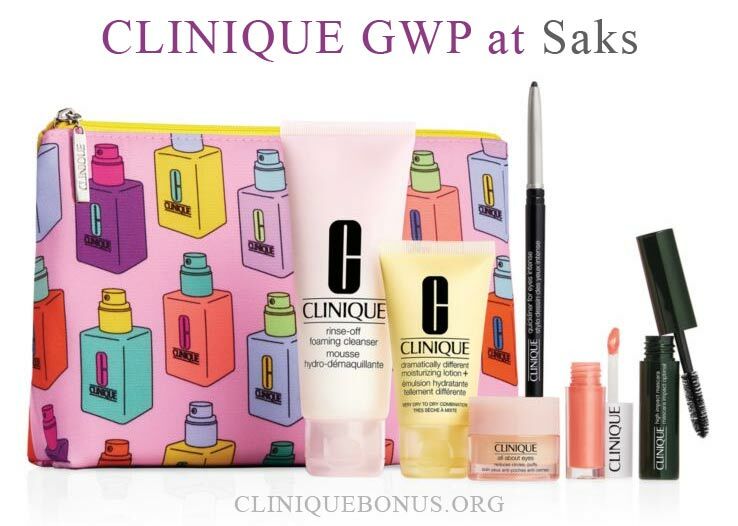 Receive your choice of a 7-piece Clinique gift with any C$39.00 Clinique purchase at The Bay. A $100 value. Enter promo code SPRING now through March 28 and get $10 off $75 beauty purchase. Shipping is free with any beauty purchase. 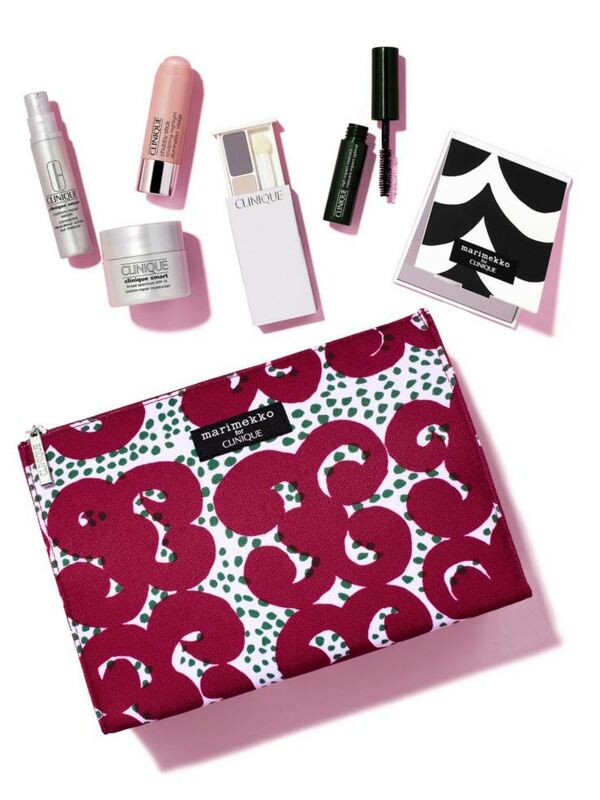 Spring 7-piece Clinique gift – free with any Clinique purchase of $29 at Dillard’s (online and in-stores) from March 3, 2019 – while supplies last. Plus, there is also a step up gift – yours with any $55 purchase. And super step up gift – with any $75. Shipping is $8.50, free for Dillard’s cardholders. 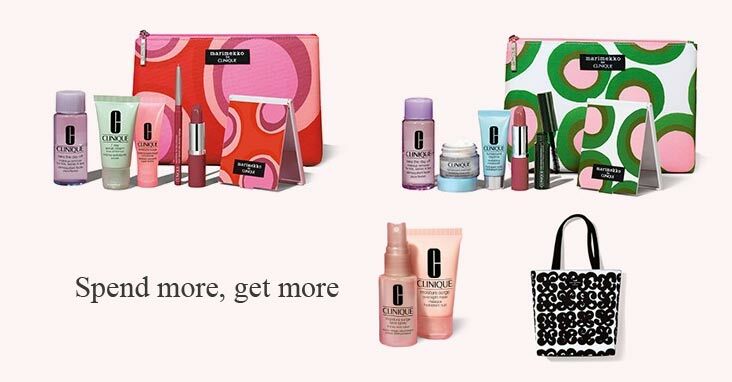 Spend $29 or more on Clinique at Boscov’s online or in stores and receive a 7-piece Clinique gift. FREE. Spend $55 or $75 to add more freebies. 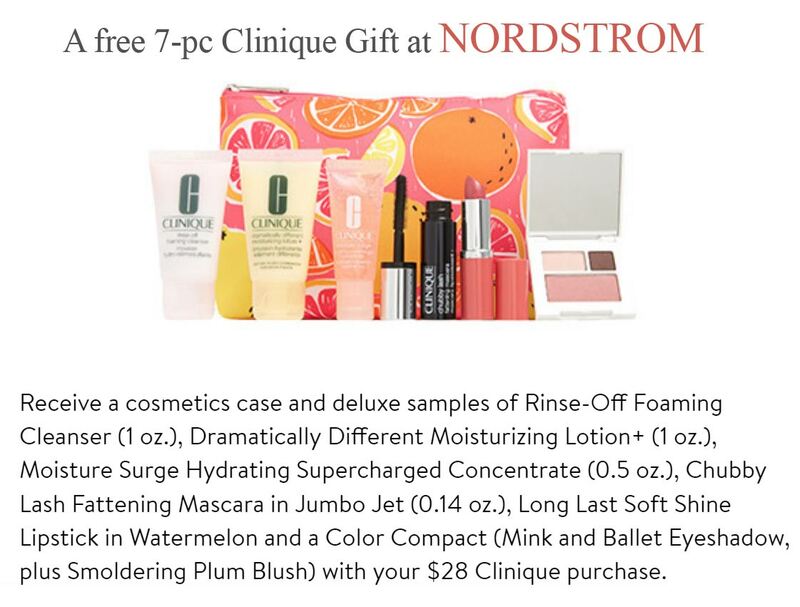 Spend $28 on Clinique at NORDSTROM (online only) and receive this 7-piece Clinique gift. While very limited supplies last. You will also receive free shipping + you can choose 3 samples. 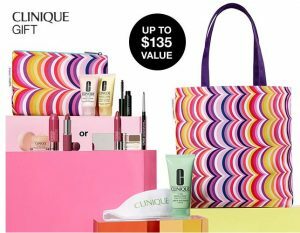 Now through March 11, 2019 receive this Clinique gift direct from Clinique.com website when you spend $65+ and enter offer code IMREADY. The gift includes: Clinique Pop Lip colour + primer, Mascara, DDML+, Moisture Surge Hydrating Supercharged Concentrate, Rinse off Makeup Solvent, Makeup bag. Enter offer code IMREADY at checkout to redeem this gift. Beauty Event is now going on at Saks.com. Spend $50 or more on Clinique and receive this Clinique 7-pc gift. Offer available now through March 3, 2019. Enter promo code CLINIQ4SF at checkout to redeem this gift! You can also enter promo code FREESHIP for free shipping. There are also other beauty GWP offers available. For example receive a free exclusive tote with dozens of samples when you spend $150 on beauty or fragrance and enter one of these codes: TOTE2SF or TOTE3SF. 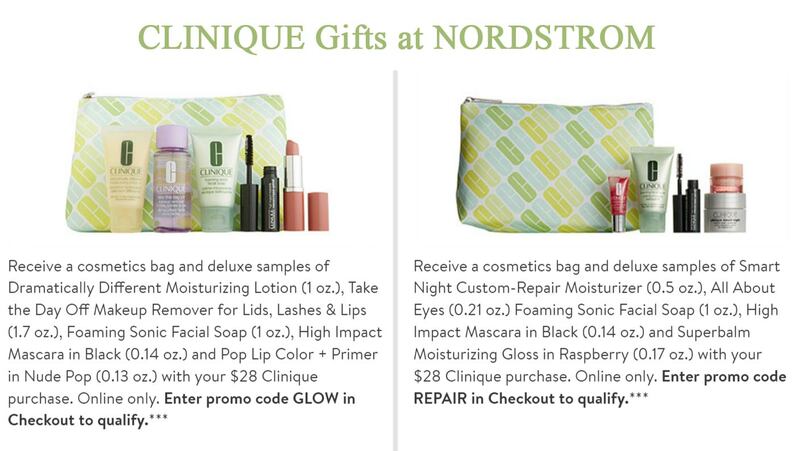 Spend $28 or more at NORDSTROM (online only) and receive your free Clinique gift. Enter promo code REPAIR or GLOW at checkout to add your free 6-pc gift. Note the GLOW gift pictured below left is not available anymore. To redeem your gift you must enter the promotional code at checkout. You will also receive free shipping. You can also choose 3 free packette samples at checkout. 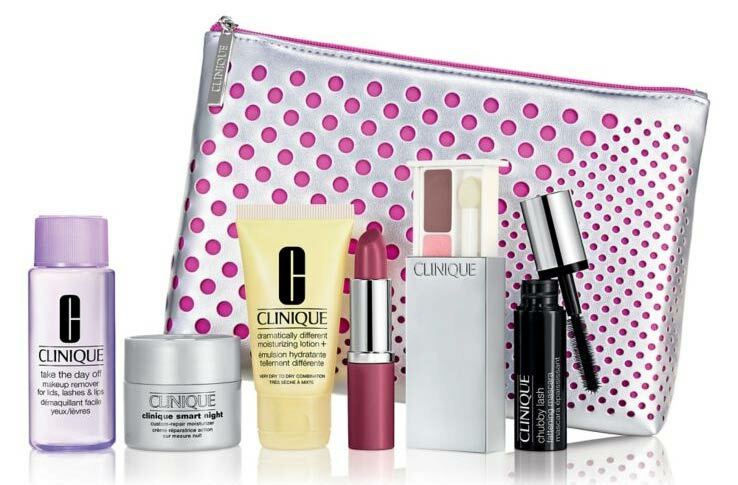 There are many beauty gifts available during the Beauty Event at Neiman Marcus – for example this 7-piece Clinique gift. Complimentary with your $50+ Clinique purchase. 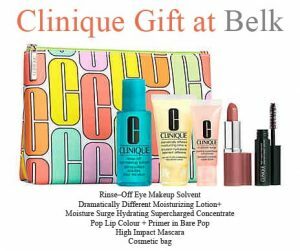 There is Clinique gift time at Belk. Receive up to a 11-piece gift. Spend $55+ and also choose All About Shadow Compact + Mini Pouch OR Moisture Must-haves Duo. The gifts will be added automatically at checkout. Enter coupon code 57553558 at Belk during checkout and enjoy 15% off Beauty. The coupon expires 2/18/2019. Offer ends on February 20, 2019. 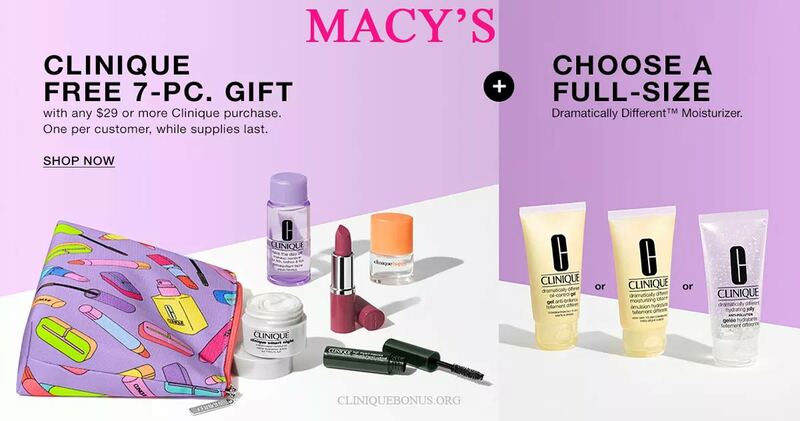 Starting from February 4, 2019 (Feb 5 instore) – spend $29 or more on Clinique at Bloomingdale’s online or instore (the offer may vary instore) and choose your 7-pc gift (valued at $100) including 5 Clinique cult classics, cosmetics bag and your choice of Moisture Surge™ product. Spend $75 and also receive a logo-printed tote. Free shipping on beauty orders over $50. A free Clinique gift is available now at Stage Stores. From January 15 – 21, 2019. Free 6-pc Clinique gift when you purchase at least $29 worth of Clinique. There are also step up gifts when you spend more ($55). The step up gifts differ in-stores. Free shipping is available on orders over $75. This bonus time ends on January 21, 2019. Spend $65 on Clinique and receive this 6-piece gift. Offer available online only at Macy’s while supplies last. You will also receive free shipping (with your $49+ beauty purchase). 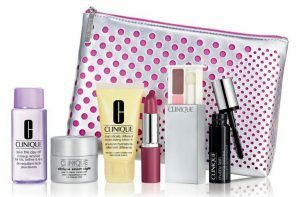 Receive this Clinique 7-pc gift-set when you spend $50 on Saksfifthavenue.com – enter promo code CLINIQ226. Plus, you can also enter code FREESHIP to get free shipping. This GWP offer ends on December 31, 2018. Note we saw this gift at Saks back in April 2018. While supplies last – receive this 6-piece Clinique gift at Lord & Taylor. Free when you spend $29+ on Clinique, no promo code required. Step up your gift with a bigger purchase – spend $55 and also receive Mini Clinique Pouch with your choice of Moisture Surge Overnight Mask or Smart Night Custom-Repair Moisturizer. Select your step up gift at checkout. 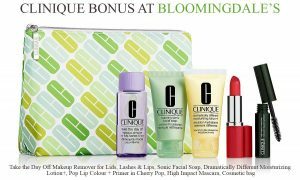 Spend $35 on Clinique.com and enter coupon code PRETTY at checkout to redeem this 7-piece Clinique gift-set. Don’t forget to enter the promo code to receive the gift. While supplies last. This Clinique gift is back in stock at Dillard’s now in December. Originally, we saw this GWP back in September. Choose your 7-pc Clinique gift with any $40 Clinique purchase. You will receive a cosmetic bag and 3 Clinique favourites + you can choose another Clinique trio. Spend $60 or more and get the Kapitza tote and a deluxe skin care treat + exclusive Clinique headband. 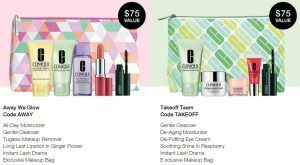 Spend $29+ on Clinique and choose a 7-pc Clinique gift set (Eyes or Lips). Enter also discount code FRIENDS and enjoy 15% off, now through December 16, 2018. 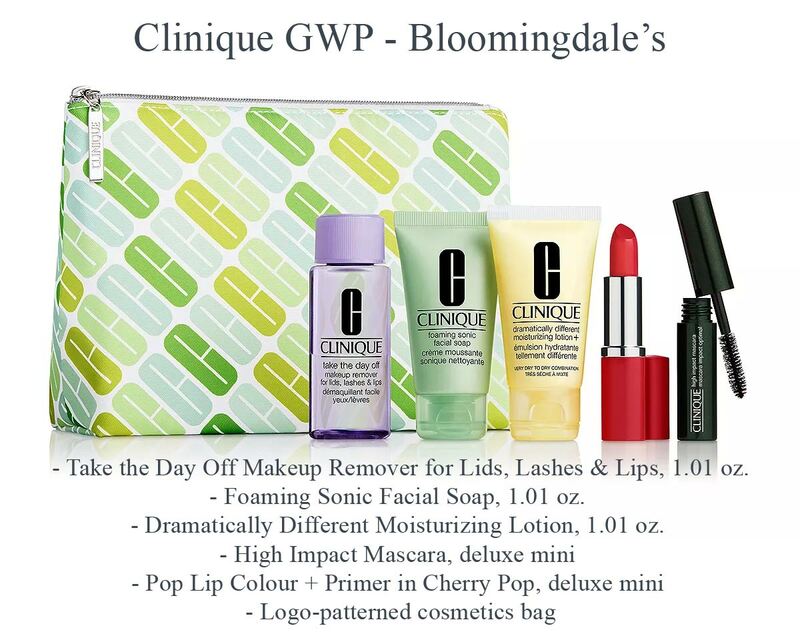 With any $50 Clinique purchase at Neiman Marcus or Bergdorf Goodman receive this 7-piece Clinique gift. 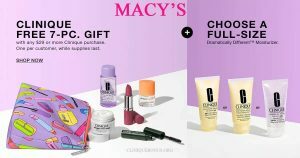 There is currently Bloomingdale’s Beauty Treats Event and Friends and Family Sale – many beauty gift with purchase offers including Clinique. Spend $40 or more and receive this 6-piece Clinique gift set. Free shipping with any purchase + get $20 off every $150 you spend on beauty (now through December 9, 2018). 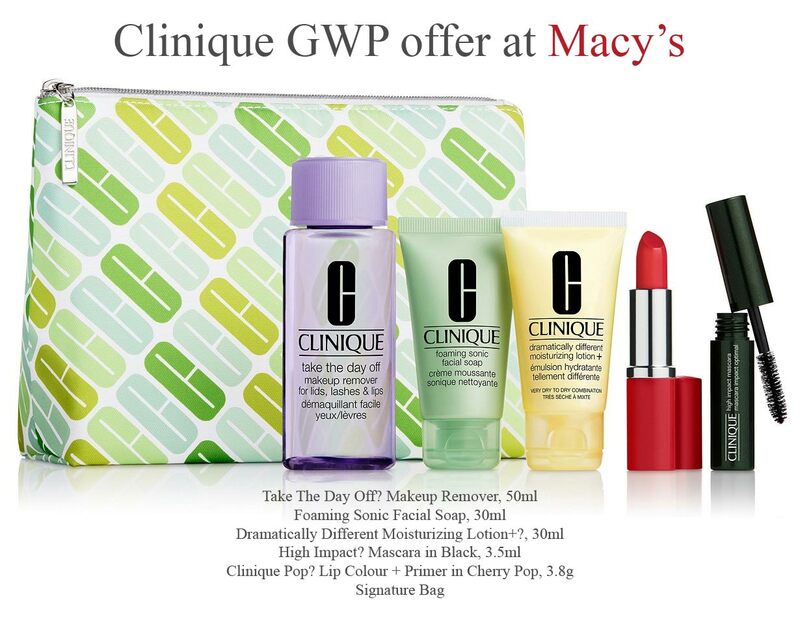 Spend $29 on Clinique at Macy’s and receive this 6-pc gift from November 25 – while supplies last. Update: A new 7-piece gift added. 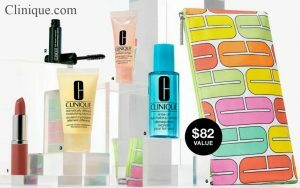 Spend $65 and enter code 25OFF on Clinique.com and receive 25% discount + this 6-piece gift set. Offers end on November 27, 2018 or while supplies last. From October 29, 2018 while supplies last there is a Clinique bonus at Nordstrom. Spend $29 on Clinique at Nordstrom (instores or online) and choose your 7-piece gift (valued at $75). Enter code LIPS or FACE at checkout to redeem your gift. Spend $55 and receive Fresh Pressed 7-Day System: Fresh Pressed Daily Booster with Pure Vitamin C 10% (0.29 oz.) and Fresh Pressed Renewing Powder Cleanser with Pure Vitamin C (7 single-use packets). Online or instore. Spend $75 and also receive a Kapitza tote. Online or instore. In order to receive one of the base gifts – you must enter promo code at checkout. The step up gifts will be added automatically. You will also receive free shipping and can choose 3 packette samples at checkout. 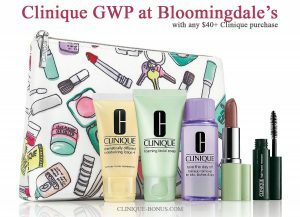 There is a mini Clinique GWP offer at Bloomingdale’s. Receive a 6-piece Clinique gift set when you spend $40 or more on Clinique. Offer may vary in-store. No promo code needed. Bloomingdale’s offers free shipping, every day, for their loyalists, it’s free to register. 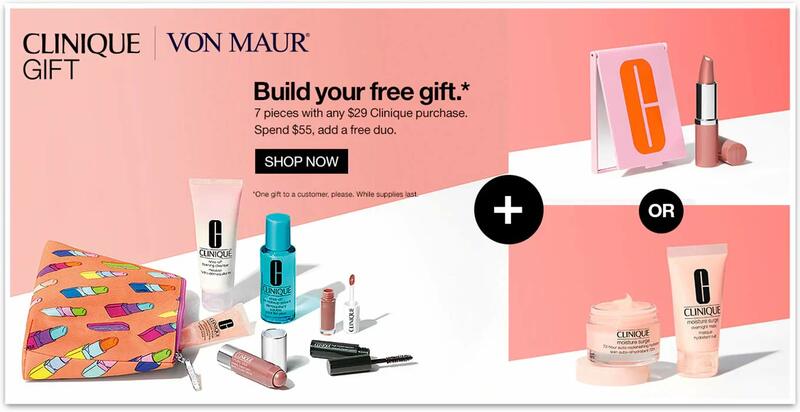 Make any Clinique purchase in total value of $29 or more at Von Maur and receive your 7-pc Clinique gift. Send more ($55) and receive also All About Shadow 6-pan Compact or spend even more ($75) for a free tote bag. It’s here! 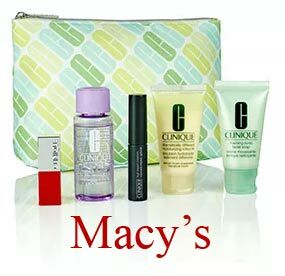 Choose your 7-piece Clinique gift from Macy’s – free with $29.00 purchase, while supplies last. These step up gifts are available online only. Gifts will be added automatically at checkout. Shipping is free. There are two similar offers now at Bloomingdale’s and Lord & Taylor. Both offers started on Sep 28. You can receive a free 6-pc Clinique gift with $40/$50 purchases. Gifts are available from August 28, 2018, while supplies last. Free shipping is on orders over $150 or free if you are a Bloomingdale’s loyalist. Spend $29 or more on Clinique at Belk and receive a free 7-piece Clinique gift. While supplies last. Spend $55 and get more gifts or spend $75 and also get a free tote bag. You will also get free shipping (no minimum purchase) on all beauty orders. 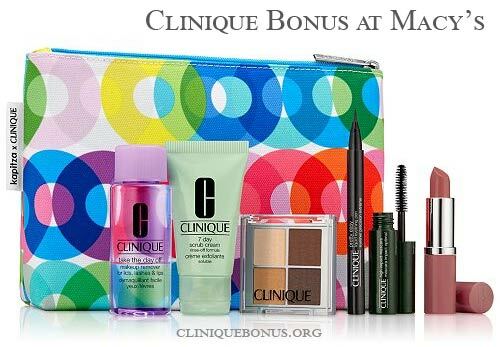 The next Clinique bonus at Stage Stores (Bealls, Palais Royal, Peebles, and Stage department stores) starts on July 2nd, 2018. Yours free with any $28 Clinique purchase. Online and in selected stores. Spend more ($55) and you will also receive a free six pan eyeshadow palette – while supplies last. No promo code needed. Free shipping on orders over $75, otherwise $8.95. Update Jun 21: there is currently a new 7-pc gift at Lord and Taylor but double check if it has been successfully added to your shopping bag before you confirm your purchase. 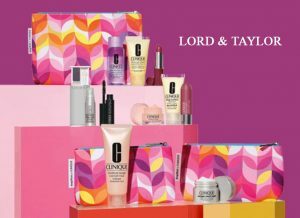 Receive your free 7-piece Clinique Gift at Lord & Taylor with any $28.00 Clinique purchase. 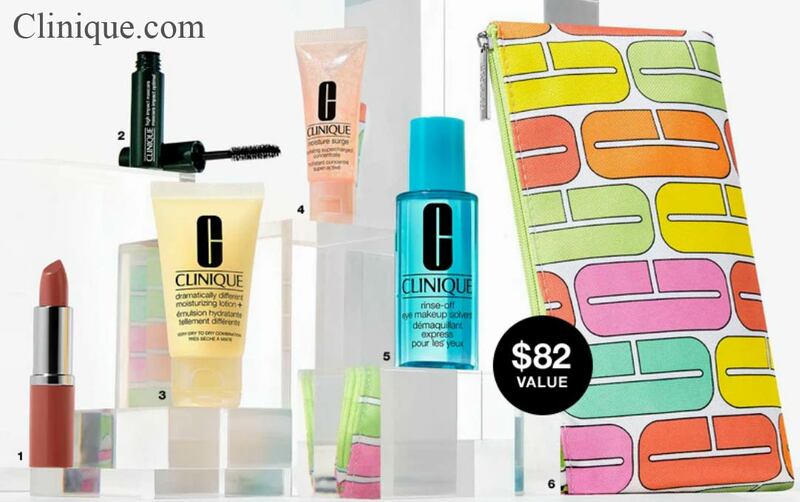 Choose one of these 6-piece gifts – free when you spend $35 or more on Clinique.com. Enter promo code AWAY or TAKEOFF. Or spend $55 and get them both with promo code BOTHTOGO. Update: This bonus time is expired. The next one will start at Lord & Taylor on June 1st, 2018. Spend $50 or more online at Lord & Taylor to receive this 7-piece Clinique gift. Free. While supplies last. Note this is the same Clinique gift as we saw at Nordstrom in October last year. The gift will be automatically added into your shopping bag, no promo code required. If you spend more – $100 on beauty or fragrance products you will receive an additional 7-piece fragrance gift set. The promotion starts on April 2018, while supplies last. Note that this offer is also available at Clinique.ca website. The qualifier is CA$35. I checked the current Jan 2016 stores that had a gift with purchase on the clinique web site. It said Nordstroms in store and online. I went to the store to be told they do not have a bonus. Four other people were in line ahead of me asking the same thing. I came home and ordered online from the clinique site and it linked me to Nordstroms. It said “spend $29 for bonus $39.50 for 4 extra clinique samples or $55 with another Bonus”. I spent $65 and received only the $29 bonus in my cart. I called Nordstroms they said they do not have the 4 samples or the extra bonus for spending over $55. I returned two items since I spent the extra$ to get the extra gift. They only had the $29 bonus gift. VERY FRUSTRATING and TIME CONSUMING! I wanted the extra bonus. Can you send me those other items if I purchase the rest of my order to equal over $55? this is strange. even on the official website the basic 7pc gift is with $27 purchase. $55 purchase is only required if you want to have the stepup gift (additional 2 items). Is the Macy’s $27.50 Bonus Days bag still available? The lavendar, orange, lime zippered 2 piece bag? May I purchase? Is there a Clinique bonus time/gift with purchase in Florida in late August early September? Is there a gift with purchase in Orlando fl in late August early September? When is the next Clinique gift with purchase in Idaho Macey’s? Do You guys have a Clinique bonus gift; at JCPenney Puerto Rico? They are always at odd times of the year and on top of that, you have to buy at least three things to have a qualifying purchase. But, I do love the Clinique ones hands down. I agree, Clinique moisturizers are all I ever use. And I am completely satisfied with the bonus gift!! Do I have to pre order the product or the bonus gift ? When is the next bonus time in Canada?